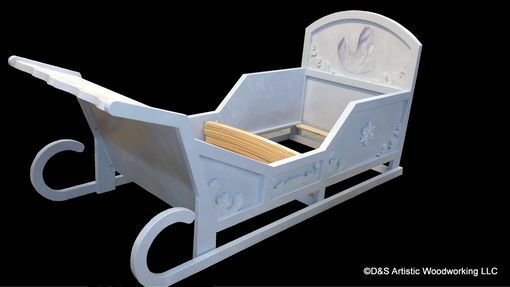 This bed is the perfect complement for a child's room with a winter theme! It is a real sleigh bed, complete with runners. 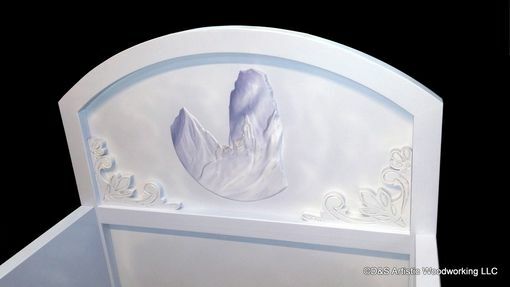 The headboard includes a carved mountain scene with a castle, airbrushed to bring out the detail and with sparkly paint to highlight the snow. The sides include carved flourishes and snowflakes. If you add licensed Disney "Frozen" sheets, then your child can imagine they are in their favorite movie! Note - there are no copyrighted elements on this bed and we cannot add copyrighted characters or logos. The bed include Ikea sprung slats to provide a firm support for a standard twin mattress. The bed is constructed of hardwood and hardboard, all edge banded and painted with latex enamel. The bed as shown is a light blue with light purple and white highlights. We can make it in your choice of colors.